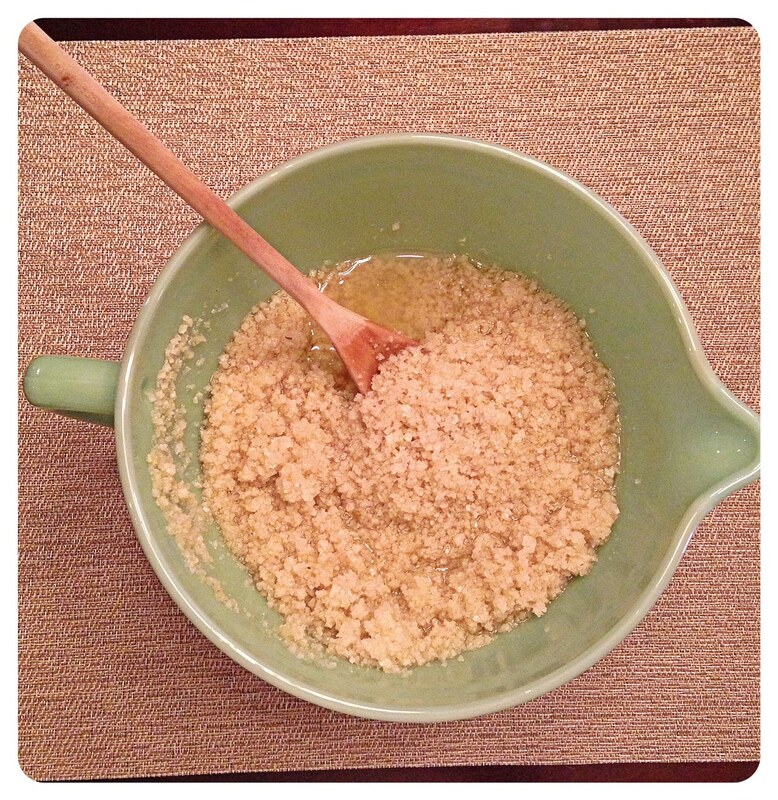 Homemade Sea Salt Scrub | Kitchenpants! So, Christmas cards didn’t happen for me this year. They didn’t happen for me last year, either…or the year(s)(!) before that. All I can say to that is that I am, at the very least, consistent. And for those of you who continue to send me cards despite my inability to get it together to send you one, thank you. It’s people like me who are driving up the price of postage, so I apologize to you for both offenses. It is because of my card issue that I have come to embrace New Year’s gifts. Yes, New Year’s gifts. For those of us who celebrate Christmas, the build-up is pretty intense and the let-down is nearly tangible. Nothing says “here’s a little something to keep you in the spirit!” like a New Year’s gift. (All right, fine, nothing says “I can’t get my act together by December 25th” like a New Year’s gift.) 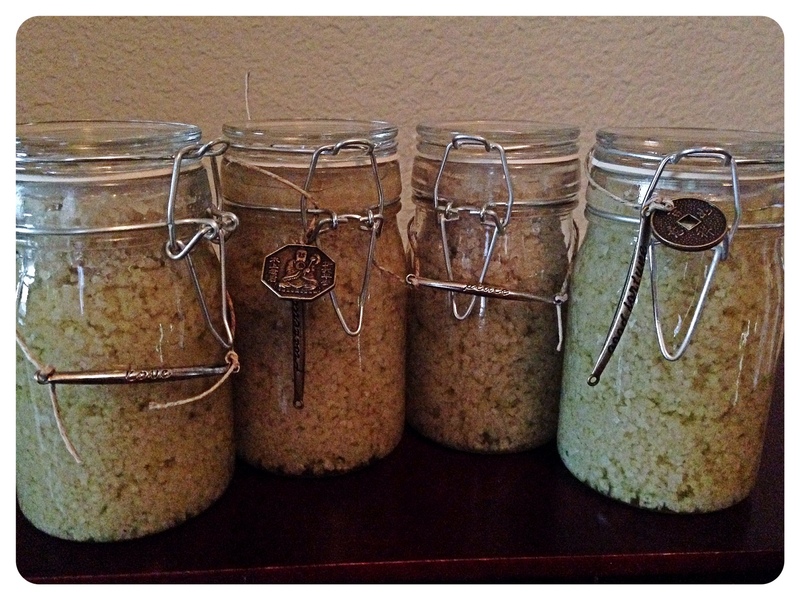 Here is what I am giving out this year: salt scrub. Toxins be gone! Let’s ring in 2014 with soft skin. It’s Christmas and I am lazy, so I am going to forgo my usual format. Making salt scrub is really, really easy. You just need three things: a quality sea salt (large grain), a light oil (I use grapeseed), and scented essential oil (Aura Cacia has some good ones for small batches). For this batch, I used a Sweet Orange oil along with a bit of Vanilla oil. Put together the scrub using a 2:1 ratio of salt to oil. I used 4 cups of sea salt (measured in a dry measuring cup) and 2 cups of oil (measured in a liquid measure). Pour the salt in a bowl and add in the oil slowly using a wooden spoon to stir. Use your judgement and preference on the consistency. I like a little more oil in my scrub so I use the 2:1 ratio pretty religiously. Then, shake in your essential oil. How much you need to shake in depends on how strong your oil is. Sweet Orange is pretty weak, so I ended up using about 50 drops of it to get the scent I wanted. I packaged mine up in these cute little jars that I found at Michael’s and added some charms that I found in the jewelry-making section of the same store. It’s hard to see in the picture, but the little labels say “love”, “prosperity”, “peace”, and “good fortune”. This project took me all of half an hour today…so it’s a quick and easy way for you to save face, too, if you dropped the Christmas card ball. 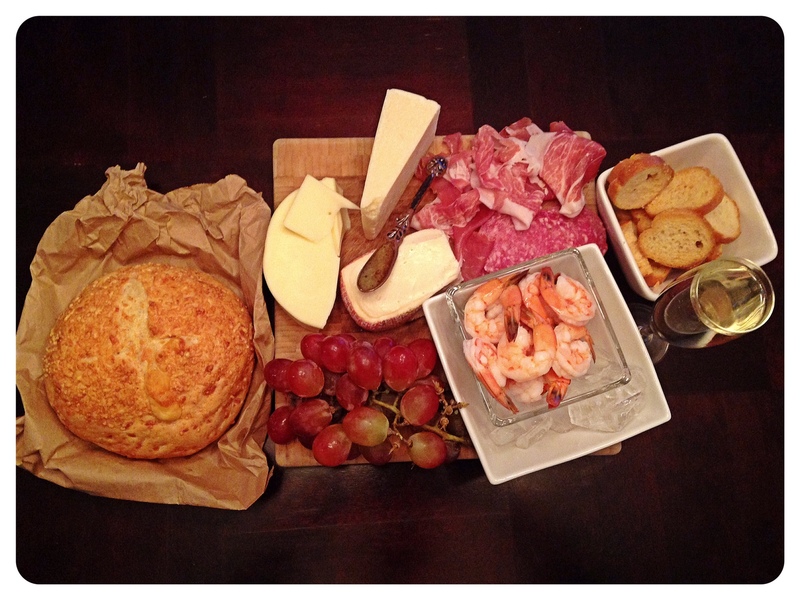 Our antipasti spread is super easy to make: grab a wooden cutting board. Add proscuitto, a dry salami, Taleggio (a spreadable Italian cheese), Provolone, Parmigiano Reggiano, grapes, chilled cocktail shrimp, and a loaf of crusty Italian bread, along with quick garlic croutons. Pour some Prosecco and sparkling apple juice (for the littles) and enjoy! Gorgeous!